One of the main issues with photographing toys is that everything gets magnified in scale. The smaller the toy, the bigger the world around the toy look. Small things become huge, and microscopic things become large. As you can imagine this makes small things like dust a big problem. A LEGO minifigure is 1:48 scale. This means that if you fill your frame with a minifig, everything else in that frame becomes 48 times bigger in comparison. A small spec of dust that would likely not even be noticed on a human model becomes massive at LEGO scale. Dust is also highly reflective, so when one adds lights into the mix, it can stand out like a sore thumb on an image, and can be large enough to hide important details. Luckily there are a few tricks to dealing with dust in toy photos. The most logical way to remove dust from toys is to simply wipe them down with a dust cloth. This seems like an obvious method. After all this is likely the same method you use to dust the items on your shelves at home. However it does have some downsides. While a cloth is effective, it is almost impossible to wipe down a minifigure, or an action figure, without moving it. Setting up a scene can take a long time, and getting toys back into the right position after moving them can be tedious. So this method is best used before you set up your figures for a shot. It never hurts to start with a clean slate, or at least clean toys. However since dust shows up at any time, it is handy to have some more tools in the toolbox for dealing with dust. These handy air blowers are intended to blow dirt off camera sensors. However they are also perfect for blowing dust off toys. The long nozzle is also great for placing a puff of air exactly where it is needed. Just be sure to not blow too hard, especially with lighter toys, otherwise you may end up knocking them over. If you don’t already have one in your kit for cleaning your sensor, these blowers can be purchased at almost any place that sells camera accessories. Many makeup brushes have very soft bristles, and those are perfect for cleaning toy figures. I must confess I am not a makeup user so I don’t know what the brushes are called. However I am led to understand that the soft brushes used for powder blush application are the best ones to use for toys. If you are not sure which brush to use, don’t worry about it too much. Makeup brush kits can be purchased for less than $10, which include a wide range of brushes. At least one of them will work perfectly. With a little care, and the right tools, dust can be banished from toy photos before the shutter clicks. The spot-healing brush in Photoshop is an excellent tool, but getting rid of dust in-camera saves so much time. Hopefully these tips will help you have a dust-free toy photography experience. During the day Dave is a Google Site Reliability Engineer, helping make the worlds information more useful and accessible. 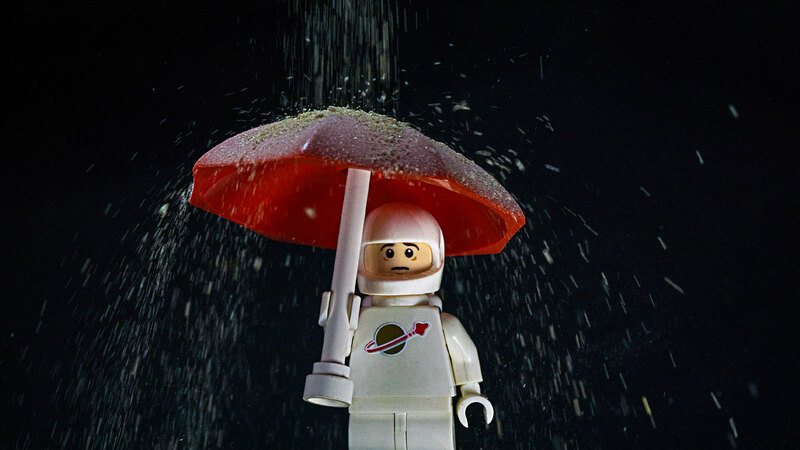 By night he creates his own worlds using LEGO and action figures. Dave was born and raised Canadian, but now lives in North Carolina. He is a graduate of The Arcanum. Such a simple thing, but definitely one that shows up a lot. Love your suggestions for dealing with dust. I carry along a couple of brushes, myself. Instead of a make-up brush I use cheap but soft art painting brushes with the long handles chopped off, because that’s what I had on hand. But the rocket air blower looks even better, especially for puffing a little dust off a figure without moving it. Great tips!